Throughout history, the expansion of human population has been supported by a steady growth in our use of high-quality exosomatic energy. The operation of our present industrial civilization is wholly dependent on access to a very large amount of energy of various types. If the availability of this energy were to decline significantly it could have serious repercussions for civilization and the human population it supports. 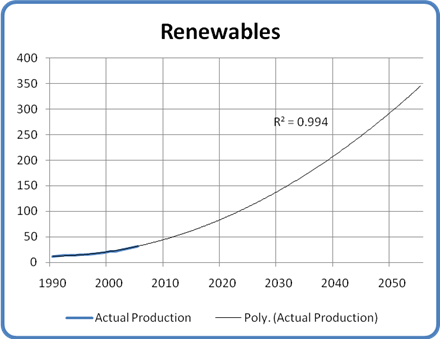 This paper constructs production models for the various energy sources we use and projects their likely supply evolution out to the year 2100. 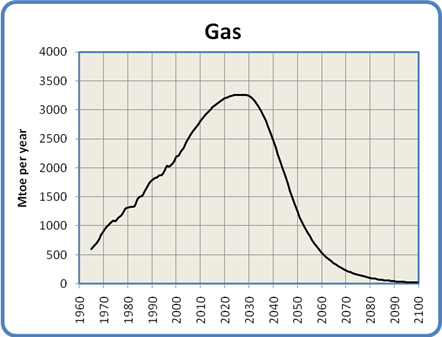 The full energy picture that emerges is then translated into a population model based on an estimate of changing average per-capita energy consumption over the century. Finally, the impact of ecological damage is added to the model to arrive at a final population estimate. During the historically recent period of global industrialization, the level of human population has been closely related to the amount of energy we have used. Over the last forty years, the per capita energy consumption has averaged about 1.5 tonnes of oil equivalent (toe) per person per year. 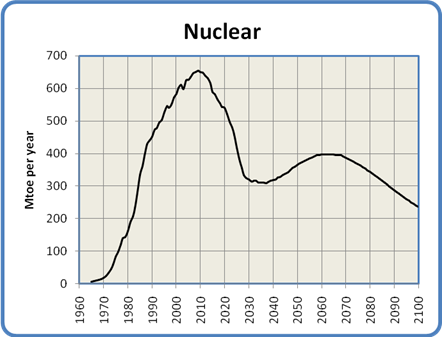 As industrialization has progressed, the amount of per capita energy used has also increased, rising from a global average of 1.2 toe per person in 1966 to 1.7 toe per person in 2006. 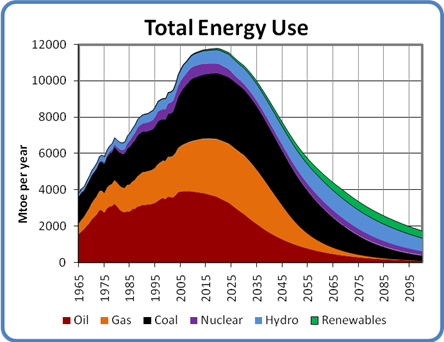 As the global energy supply tripled over that time, the population has doubled. 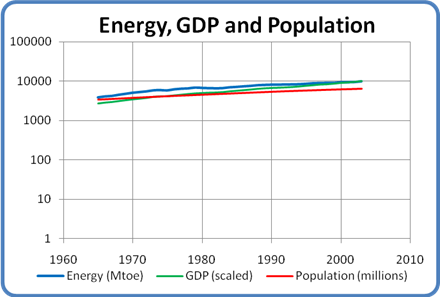 Figure 1 shows the close relationship between global energy consumption, world GDP and global population and implies that an overall increase in the energy supply has supported the increase in population. Can we assume that there would be negative consequences for the human population if our energy supplies should start to diminish? 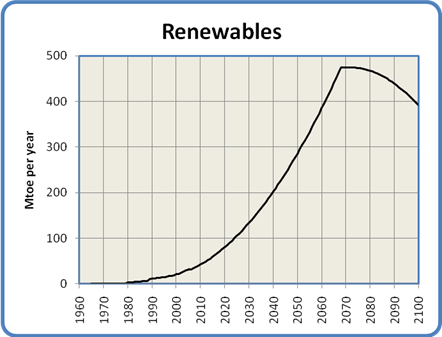 In this paper I shall present my estimate of the world energy situation over the next century, and tie that to a projection of the human population from now to 2100. 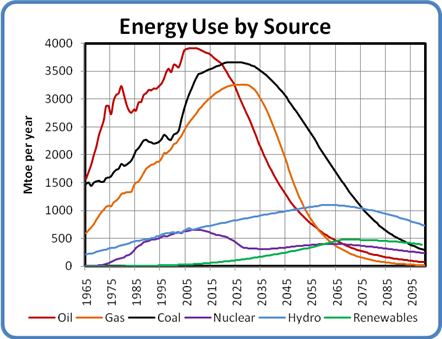 The current global energy mix consists of oil (36%), natural gas (24%), coal (28%), nuclear (6%), hydro (6%) and renewable energy such as wind and solar (about 1%). Historical production in each category (except for renewable energy) has been taken from the BP Statistical Review of World Energy 2007. In order to permit comparison between categories I use a standard measure called the tonne of oil equivalent (toe). Using this measure, well-known conversion factors permit the energy obtained from different sources to be easily compared. While this approach doesn't take into account the varying efficiencies of different sources like oil and hydroelectricity, it does provide a well accepted standard for general comparison. We will first examine each of the energy categories separately, applying the development parameters that seem most appropriate to each. For each component I will define as clearly as possible the factors and parameters I have considered in building its scenario. This will allow you to decide for yourself whether my assumptions seem plausible. We will then combine them into a single global energy projection. 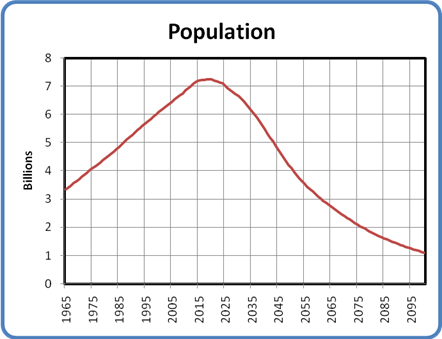 Once the energy picture has been established we will explore the effect the projected changes in energy supply may have on the world population. Once that baseline has been developed, we will incorporate the probable effects of ongoing ecological damage to arrive at a final projection of human numbers over the next century. The WEAP model was developed as a simple Excel spreadsheet. The timing of significant energy-related events and rates of increase or decrease of supply were chosen through careful study of the available literature. In some cases different authors had diverging opinions on these matters. To resolve those situations I have relied on my own analysis and judgment. As a result the model has remained open to the influence of my personal biases. I make no apology for this; such scenarios always reflect the opinions of their authors, and it is best to be clear about that from the start. Nevertheless, I have made deliberate efforts throughout to be objective in my choices, to base my projections on observed trends in the present and recent past, and to refrain from wishful thinking at all times. The WEAP model presents a global aggregation of the effects of energy and ecological factors on world population. Although there is some discussion of regional or national differences (which would be expected to have a profound impact on the course of events in those places), the model does not directly incorporate such influences. While you may see this lack of granularity as a shortcoming, the paper is intended to give a higher level view. Its purpose is to establish a broad conceptual framework within which such regional disparities may be understood. This paper will not present any prescriptive measures. The analysis is intended solely to clarify a "most likely" future scenario, based purely on the situation as it now exists and will probably unfold. You will not find any specific suggestions for what we ought to do, or any proposals based on the assumption that we can radically alter the behaviour of people or institutions over the short term. While the probability of such changes will increase if the global situation shifts dramatically, such considerations would introduce a level of uncertainty into the analysis that would make it conceptually intractable. The same constraint holds true for new technologies. You will not find any discussion of fusion or hydrogen power, for example. The Excel spreadsheet containing the data used to assemble the WEAP model is available here. The analysis of our oil supply starts from the recognition that it is finite, non-renewable, and subject to effects which will result in a declining production rate in the near future. 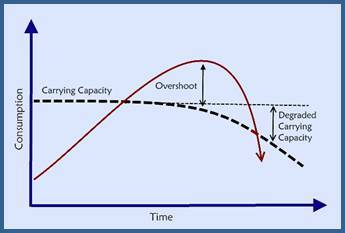 This situation is popularly known as Peak Oil. 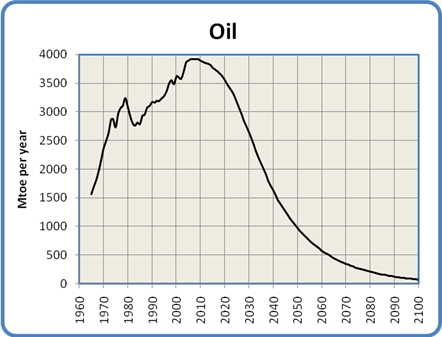 The key concept of Peak Oil is that after we have extracted about half the total amount of oil in place the rate of extraction will reach a peak and then begin an irreversible decline. My position is in agreement with the luminaries mentioned above, that the peak is happening as I write this (in late 2007). I have confirmed this to my own satisfaction by examining the pattern of oil production and oil prices over the last three years. I discovered in the process that crude oil production peaked in May 2005 and has shown no growth since then despite a doubling in price and a dramatic surge in exploration activity. Before we leave the subject of oil, some comments about oil exports are in order. The graph in Figure 2 shows the aggregate oil production for the world. However, the world is not a uniform place of oil production and consumption. 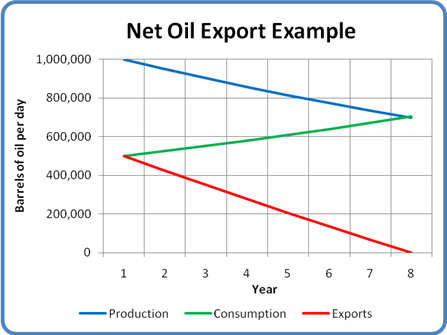 Some countries are net exporters of oil, while some are net importers who buy the exporters' oil on the international market. In most countries the demand for oil is constantly increasing. This applies especially to oil exporting nations, where rising oil prices have stimulated economic growth. This additional growth has in turn resulted in a higher domestic demand for oil which is satisfied out of their surplus before it is made available for export. While the nation's oil production is increasing this does not pose much of a problem. 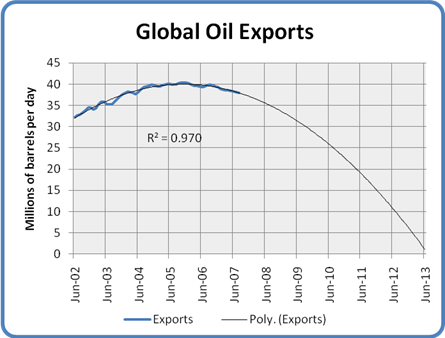 When the exporting nation's production peaks and begins to decline however, something ominous happens: the amount of oil available for export declines at a faster rate than the production decline. This has become known as the "net oil export problem". The Energy Watch Group has conducted an extensive analysis of coal use over the next century, and I have adopted their "best case" conclusions as a starting point for this model. 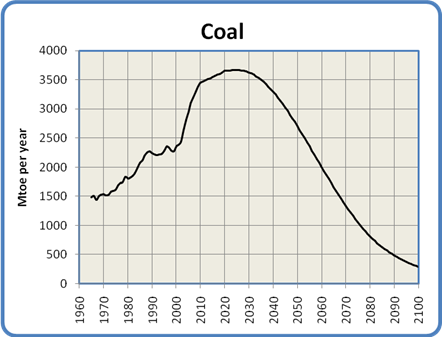 The model projects a continued rise in the use of coal out to a peak in 2025. As global warming begins to have serious effects there will be mounting pressure to reduce coal use, resulting in a slightly more aggressive decline slope than the one projected by the Energy Watch Group. Unfortunately, due to its abundance and our need to replace some of the energy lost from the depletion of oil and gas, the decline in coal use will not be as dramatic as seen with those fossil fuels. The model has the annual decline in coal use increasing evenly from 0% in 2025 to a steady 5% annual decline in 2100. These assumptions give the curve shown in Figure 6. 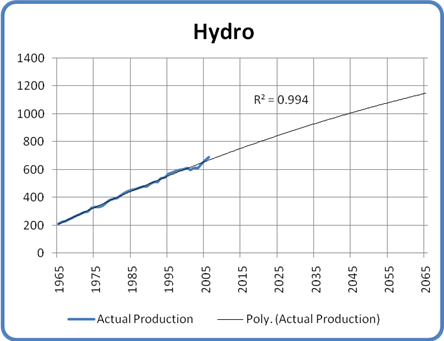 The model for hydro power shown in Figure 9 has capacity growing to about double its current level by 2060. It then declines back to the current level by 2100. 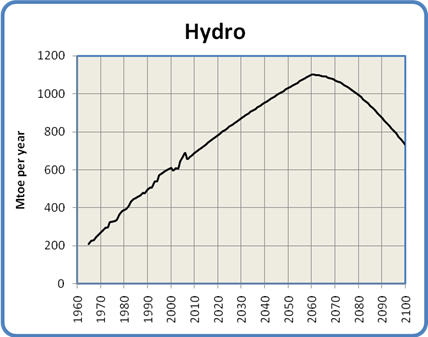 The peak and subsequent decline in the second half of the century is attributed to the full occupancy of virtually all high-value hydro sites, a general loss of global industrial capacity and a reduction in water flows due to global warming. These are the external influences mentioned above. Proponents of the Demographic Transition Model have a more difficult time. That model proposes that as a society industrializes it goes through two phases, the first consisting of rising life expectancies, the second characterized by a drop in fertility. 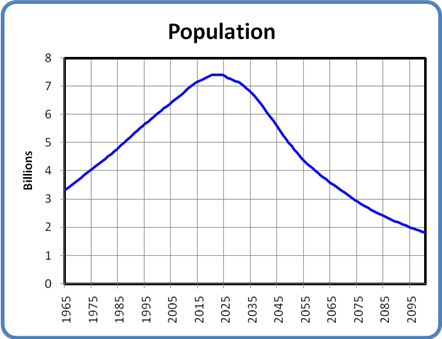 The society transitions from a demographic situation of high birth and death rates through one of high birth and low death rates, to one of low birth and death rates. I have published a study examining the energy that might be required to bring the world to a stable or declining population by this method. The result of that study was that it would take over five times the energy we use today to accomplish this, which is clearly an unrealistic expectation.